Planes, boats and bicycles--sv & rv Odin: Newbie RV lessons, Are we level? Are we level? The short answer is NO. The one thing we haven't mastered on our coach is the levelers. We learned one trick before leaving Camping World, but still left a little mystified. Oftentimes, despite our best efforts, our parking spot isn't level. It isn't annoying at first, but after a day of two, it becomes more obvious. The bedroom door won't stay closed, the front door won't OPEN, the shower door (that contains the litterpan) has to be propped open, the bathroom door doesn't cooperate, the pantry slides out unannounced, it's hard on the fridge (electric and propane) and can even make it difficult to get the slide back in. 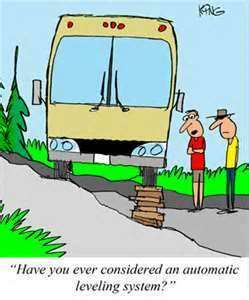 We're still new to RVing and haven't talked to enough people to understand 1) what we're doing wrong or 2) what's wrong with the system. We thought part of the problem might be our levelers don't go all the way down, so we got some wooden blocks--specifically for those times where the spot was REALLY unlevel. That just adds a step to the process. Being level is overrated, really. On bad days, I refer to it as my core workout. After all, we live on a sailboat six months of the year. I have to stay in shape. Our monohull friends are probably laughing. "Level? What's level?" But we own a catamaran and should be able to sit down our glass of champagne without it spilling--that's what the brochure says. Then he continues to lower the levelers. They are so SLOW! Just when we both doze off, they are suddenly down. During today's attempt two new things happened: 1). We always try to back WAY into the spot. Our rear tires are a significant distance from the back of the coach--at least 7 ft, so if I bring him all the way back to the curb, we are usually hanging over the back of the pavement. This gets us closer to the power pedestal and leaves room for visitors to park in front of us (since we don't have a car yet). However, luckily I was paying attention, because one of our back levelers would have hit the curb at an angle! ALWAYS CHECK CURB LOCATION TO LEVELERS! Good to know. 2) I walked around the coach to check the right rear and when I walked back around, the left rear tire was OFF THE GROUND! This is exciting for a couple reasons--there's a big controversy about whether you should raise an RV this far. I'm not a fan (again, we weigh 26,000 lbs--I can just imagine that leveler giving out in the middle of the night and dropping us onto the concrete--while I'm sleeping right above it...) BUT, we were also concerned our levelers weren't as "strong" as they should be, but apparently they CAN raise the RV off the ground, which is good to know! Yes, he immediately lowered the left rear, despite the fact, "But we're totally level. The bubble is in the CENTER!" (Reluctantly lowered). In debrief, The Colonel said, "For the first time, I felt like the levelers were doing what they were supposed to do." We aren't sure exactly how long Odin sat before we bought him. Perhaps we are still working off some rust. Or maybe he's finally warming up to us. Perhaps a few more kisses and pep talks from Momma. I was lucky enough to retire a few years ago, and my husband will join me in this blissful state next year. We are searching around for an RV so we can hit the ground, and we've been looking online to see what issues we might face. I love the humor in your post, but now I also know about an important issue. Thank you for this timely post. Thank you, Liza! I'm glad you enjoyed it. I wrote a few other posts on how we picked our RV and an end of the season summary. I hope they help make shopping more fun.